With classic symbols on the reels, some fast gameplay, and some great betting options, OpenBet’s comical fruit-themed slot, Astro Fruit, is a great online game for those who hanker for a little of the old Vegas action. On the 5 reels in this 20 pay-line game are plenty of old-school symbols like melons, lemons, bells, cherries, 7s (both blue and red), BARs, pineapples, grapes and plums. Pineapples pay out a whopping $250,000 if you hit five pineapples across the reels. The green Lucky 7 is the game’s Wild, and it substitutes for all regular symbols in the game, other than the Scatter or Progressive Jackpot trigger icon. The cheese symbol, meanwhile, triggers a straightforward free spins bonus round when you hit three or more of those across the reels. Well, I say, ‘straightforward’. 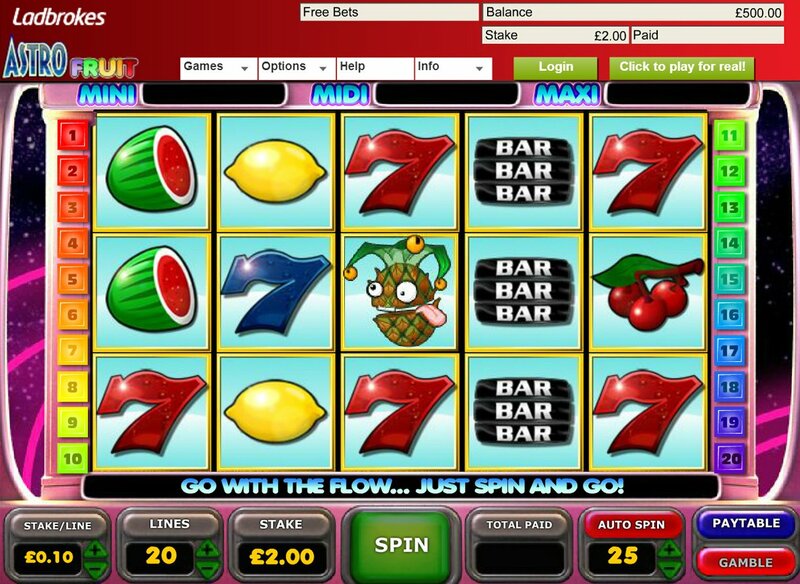 When the free spins round is activated, you’ll be shown the 15 symbol boxes on the game screen with question marks inside them. Behind each spot is a spin value or command, like ‘Start Free Spins’. Keep selecting to build up your spins haul until you hit ‘Spin’. You can also hit Super Wilds which come into play during the free spins round. Spins can be re-triggered during your bonus turn, and in all it can prove to be a “fruitful” bonus feature overall. Be a Plum and Win the Progressive Jackpot! If a free spins round doesn’t quite float your boat, don’t forget there’s also a progressive jackpot to hit in Astro Fruit; well, three, actually. The purple plum symbol (the one with the crown) is the icon to look out for, as at least three across the reels will trigger the jackpot. Three symbols triggers the mini-jackpot, four plums the midi, and five plums the maximum progressive jackpot. Check out the counters at the top of the game screen to see where the jackpots are up to at any given time. As it goes with OpenBet slots, Astro Fruit certainly delivers: there are plenty of great old-school symbols, and the progressives are attractive. The betting offers big bettors the chance of some great wins, but bonus hounds will baulk at the measly free spins round which I found pretty tough to hit most of the time. 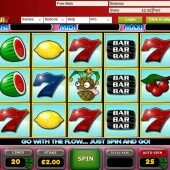 For classic fruit-based fare, make sure you check out Microgaming’s jungle-themed Mega Moolah – which comes with its own big progressives, of course – and the extremely fruity-themed Fruit Shop slot from NetEnt.